Babies are a wonderful blessing from God. Salt Creek Embroidery can help to welcome that new baby with many fun and creative gifts that are very reasonably priced. Personalized pastel fleece blankets with all the baby's birth information are not only soft and cuddly, but are a keepsake that can be treasured forever. On the backside of the blanket, a soft protective fabric is fused onto the blanket, so that the underside of the embroidery does not scratch the baby. Embroidered cloth diapers make incredible burp rags. These soft cotton diapers are not only cute, but very practical and absorbent. If you have more than one child, they are great as older children can "read" them to younger siblings. Because they are constructed from soft cotton flannel, they are perfect to take along to church as they don't make noise when you turn the pages. 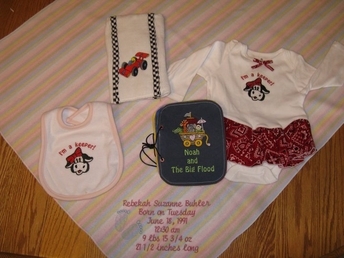 At Salt Creek Embroidery, we love to create wonderful baby gifts. Contact Barb when a special little one is entering your life to see how she can help you find that perfect gift that will be cherished forever.